I'm sitting here grooving out to some Herbie Hancock (Headhunters) while my Mom has disappeared into the basement to finish the annual Christmas pajama pants for my brother, sister and I after which the annual tradition of waffles, homemade fruit-sauce topped with whipped cream and some fresh farmers sausage will be made and consumed. Yes, the tradition in my familiy's household is to have my Mom, work until last minute making us each a pair of new pajama pants which we get to open after the above mentioned meal and wear to bed. If she for some reason does not finish them we open them first in the morning and wear them around for the morning while we be lazy and eat fruit and dip and open presents. This past week has been productive in many ways and unproductive in other ways. I have hardly touched my violin aside from a Christmas concert I did out of town which was fun. That was the one with the Nutcracker that I never got music for. It was great to be a part of that event as I found out upon arrival that the conductor wanted to bring an orchestra to that community really badly and he paid for all the musicians and everything from his own pocket. It was fun and light-hearted and the audience seemed to love it. Today I actually managed to get motivated to pick up my violin again. Sometimes you need a few days off when you don't really think you do and it felt great to play again. Things felt fresh and relaxed again even with all the upcoming stress of my exam. So that was a nice suprise to get a good bit of work done on some technique and etudes. Merry Christmas and Happy New Year to you all. I hope you have a wonderful season of celebration, friends and family no matter where you are and what you celebrate. School is done for the holidays (sort of - nothing like having to read an entire, fat book and do a whole wack of writing assignments on it...), I have a break from teaching for a couple of weeks and I got another gig! But first! The recital last weekend. I was one proud teacher! The concert started off with a massive group of violin players from as young as 4 to adults in their 50's! It was interesting to say the least. It's extremely hard to keep so many people together when they aren't used to playing in large groups but it was fun! My teacher and I both kept things generally on track and I think the kids had fun. My first student to play was the first solo performance of the day (see picture). 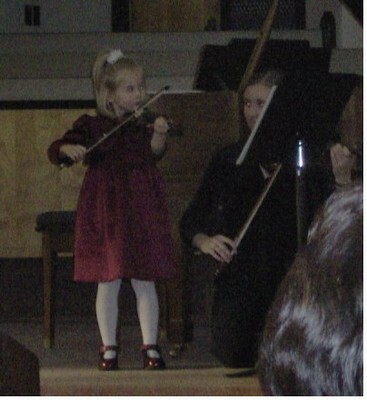 A darling little 4 year old, who had gotten a new dress and matching shoes for her first violin recital. She had learned Jingle Bells to play with the bigger kids and adults and she learned a traditional French Folksong to play for a solo. As we were up on the stage and I was helping her get her music set up and the stand adjusted she plunked herself in front of me and said excitedly, "Kelsey, I've been waiting for this day for a very long time!" As we were about to begin she looked out to the huge audience, her parents and grandparents were sitting in the second row so she used her to point them out to me and everyone else. Then we got playing. She did a really good job! She had very good intonation and kept the piece going with no breaks! At the end of her very professional little performance she put her violin in rest position and bowed and then blew a kiss to the audience, grabbed her music and bounced off the stage back to sit with her parents. I got a bit of a break for awhile to sit and listen and then I had two of my Suzuki groups close together and another student who played a solo. The solo came first. This fun 7 year old blew me away the week before the recital when she said she had learned Perpetual Motion on her own (this kid can sight-read like no-ones business!). She played it for me and I couldn't say anything except "wow!" It ended up being the piece she chose to perform on the recital and she did it a great sound, great intonation and professionalism and musicality that's pretty brilliant for her age. Her friend and fellow Suzuki student came up and joined her on stage next and together we played Allegro and Dredyl. These two girls have hit it off in a group this year and they both started in late Septemeber and have blossomed. They pick up on things quickly and they are really sensitive to each other in group classes and they are a pure joy to teach. I always look forward to their classes each week! My next group, and last group signed up for the recital ended up being very small. Another group of two girls who have played together for two years now and like my above mentioned group have made some really great sounding music together and had fun doing it. Unfortunately one of them sprained her ankle badly the night before the concert so the group performance turned into a duet. We played the Bach Musette at the beginning of Suzuki book 2. Dynamics, good intonation, musicality and fun. My students all blew me away! I couldn't be more proud of them! Tonight my violin teacher and I are doing a wedding and reception which should be fun! It's so much more fun doing things like that with another person and especially someone you really enjoy playing with. I find my teacher is very easy to play off of and we have a lot of fun when we play together. The exciting gig has got to be the one I will be doing next week. I haven't got my music for it yet but I know what we are supposed to be playing. The Nutcracker! I played this once several years ago, my first year and first ever orchestral concert...no wait second....the first one was as part of this massive string orchestra (150+ players! :O) and then the next month the youth orchestra I played in at the time got to be guests in the local professional orchestra's Christmas concert tour! We got to play some Reveultes, Anderson and the highlight for me was the Nutcracker. I loved it! So I'm very excited to get to play it again, now! If I don't get a chance to blog again before the 25th. "Romeo, Romeo, where art thou Romeo...." Oh wait...I'm doing Hamlet. "To be, or not to be: that is the question:"
Alright, now that I have my play right, I can continue on in the proper manner. It's starting to feel like Christmas. There's the blatantly obvious - christmas decorations - and other advertising for the holiday season everywhere. There's the fact that every single one of my students is playing at least a carol or two of some sort. There's the little detail of Christmas shopping....which I am proud to report I have gotten all gifts more than a week ago with the exception of one gift "supplment." There's the boxes of chocolate that keep getting dropped off at work to eat. There's the many christmas productions that seem to pop up in the last couple of weeks before Christmas. And, of course, there is my annual Christmas baking which I started last week. All these things help remind me that Christmas is scarishly near. I also am sitting here asking myself how September-December could go by so fast and I can hardly remember what has all happened in the last few months. One last big reminder it's got to relatively close to Christmas. It's been unseasonably cold here and we have snow!!!! Now, why the random bout of Shakespeare at the beginning you ask? Well...this week, as is typical with one of my English teachers, when you do Shakespeare you better bet you have to act at least some of it out. Last year we did Macbeth and I got to be a witch (there's probably even a blog entry on it somewhere around this time last year). This year Hamlet is the victim play of choice. I've done Tempest and am currently doing King Lear in a Literature class but Hamlet is the play I get to act from. The assignment? 25 lines, memorised, rehearsed (and possibly copied and pasted from a couple of different sections of the play) and then a seminar presentation explaining which of the topic choices I (and my acting buddies) had chosen and how it fits into the play and why it's important and a bunch of other stuff I can't remember off the top of my head. But anyways...so my friends and I, a group of four, are covering two topics in one big presentation. Me and one friend are being Hamlet, the ghost, Laertes and Horatio and the other two or being the King and Ophelia. I'm Hamlet at first, then I get to switch spots with my friend and she's Hamlet when he dies so I can be Laertes and Horatio. I think it will be a lot of fun! Our topics of choice are rot and madness. I get to cover the rot bit! Today is the big, huge, marathon christmas recital put on by the music school I work at. Almost all of my students are playing and the recital is expected to run about 4-5 hours. Ah! I am leaving at intermission though because all of my students will be done by then and the way will need to be made to make room for the second half of people who show up. Also my sister flys home this afternoon and that's roughly where/when intermission will be. Yesterday I had my first violin lesson with my teacher, Liz, in a month! It was good, I've been sick the past week or so so I wasn't the most practiced up or awake for it but it was a good drill for my upcoming exam in January. We worked through a good chunk of the technique portion and worked on my study and because I really wanted her to hear my Bach Fugue and hear what I had done with it since my last lesson with Mr. Wood, I got to play that as well! After that, we had an outing together. We went out to dinner at one of the best Greek resturaunts in town, and I got adventurous and tried a couple of new food items which all except the fish mix i liked. After dinner we went out to see a student of my teacher's and someone that I know from various musical events, sing in a musical that was "not recommended for children under 8 years of age." Which was also great fun! Other randomness...there isn't much. Oh!!!!!! Oh!!!! Oh!!!!! Do listen to the audio file I attached "I want a hippopotamus for Christmas" because it's highly entertaining! I should be singing "stop the snow...stop the snow...stop the snow" because of how much snow we've gotten in the last several hours and the road conditions that have to be driven in (luckily not by me) but I love the snow and all of it's beautiful, white, fluffy properties (or maybe heavy properties...?). It's hard to believe it's December. What happened to 2005? It's the end of another long-ish week (though it doesn't feel as long or exhausting as last week) and now it's down to the final two week crunch before the christmas break. I have two weeks left of teaching and a few concerts and gigs left. The most stressful one is out of the way though now. That was the faculty concert last weekend. It was a lot of fun, but definetly stressful. A new type of pressure performing as a faculty member and teacher as opposed to performing as a student. It's kind of an interesting and unique spot I'm currently in, in that respect. I'm both a teacher and a student so it's neat to get the best of both worlds. On Monday I have a first for performance settings. Poetry reading at a local university. Yes, that's right. A poetry reading. Has anyone done anything like that before? It sounds straight-forward and simple. Now I just have to hope the poetry is good. The big annual christmas recital put on by the music school I teach at happens on December 11th. Currently all but 1 of my students are playing. I'm going to be kept very busy! I have an adorable little 4 year old who's going to play a French Folksong for everyone. She even got a new red dress and shoes for the ocassion....her first recital! I have a 7 year old who can sight-read like no ones business who's playing Perpetual Motion. My Beginner and Advanced Suzuki groups are going to strut their stuff playing My Dredyl, Allegro and Musette. Everyone (even the 4 year old!) is playing Jingle Bells and it should be a lot of fun! Busy, but fun. This weekend I start my shopping for the season. I have ideas of what to get some people but others I'm at a complete loss as to what to get. 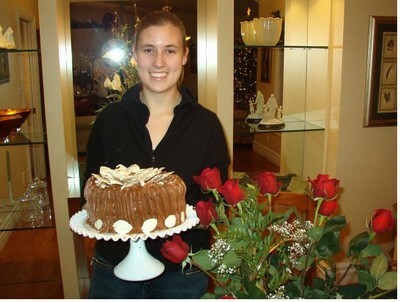 If all else fails...chocolate! Actually, I need to do some of my annual baking and then I'll be set. Last year I did literally hundred's of cookies! I don't know if I'll do that this year but I intend to do some baking at least. My holiday project is cleaning and sorting through my room and getting pictures on my walls. I painted my room at least about 2 years ago...bright blue and yellow...and i hadn't put any of the pictures/posters up that I had to put up or the funky wooden framed mirrors that I painted and today, finally...I've started to un-earth the floor in my room and pound some nails into the wall to hang pictures up! Yay! In other news...I got my exam date today. 2 months from now my grade 10 violin exam will be done, gone and history forever! Unless I fail it in which case I'll have to go and do it again. So January 21st, at 9:40am in the morning I begin the longest, played exam in my life as of yet. I'm not too happy about it being 9:40am in the morning because it's a good 80 minute drive to where the exam is and then it's in winter conditions. I'll have to leave by about 7:30 to gaurentee I get there in time and probably leave a bit earlier than that so I can be there to sign in and warm up. 2 more months and I can pick out a new repertoire for the ARCT performance diploma exam. I'm excited! This goal that seemed so unattainable when I was little is actually happening and it's exciting!